“The cows are coming! The cows are coming! Get the apples!” The kids shouted from the back of the house. They could see them coming through the back windows. One at time. In all their glory. The cows. They were curious cows looking for a treat. Earlier, the group had gone around the corner to pick apples. 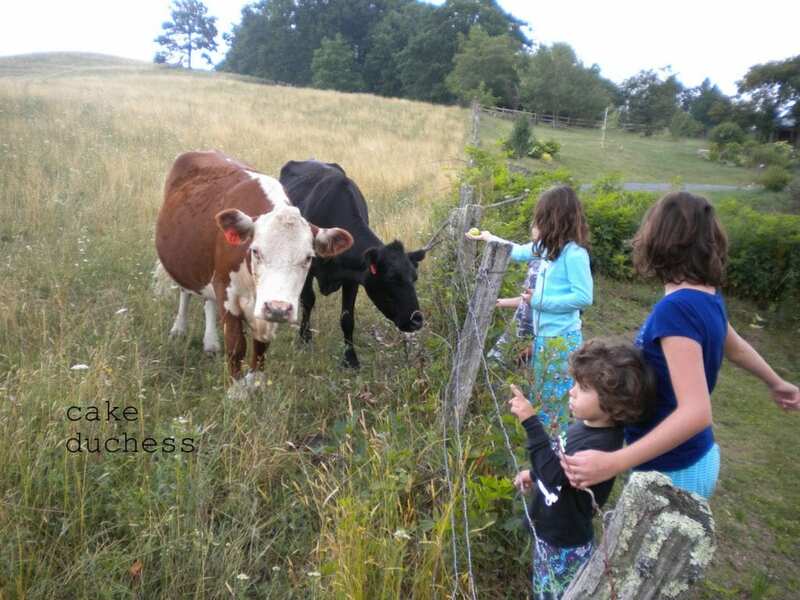 They weren’t sweet yet as it was the middle of summer, but the cows weren’t complaining. Slowly, the older, bravers ones started to approach the fence. They were coming to say hello to the friendly faces offering them a morning snack. The calves stayed behind in hesitation. They didn’t know yet what to think of this boisterous group jumping up and down. We loved the time we got to spend with these gorgeous cows this summer. We know they won’t be there next summer if we get to return to the mountains of North Carolina. Now on to this yumminess. A galette is a rustic tart. You can fill it with whatever your heart desires. I am particularly fond of apple desserts. Apples and caramel, high swoon factor. Apples with Sicilian sea salted caramel, get me some oxygen. This galette is fabulous even without the caramel. And if you do decide to go for the caramel layer around the rim, you’re lucky. If you happen to have a nice, coarse sea salt. Great! It doesn’t have to be Sicilian. Just trust me when I tell you, that salted caramel is addictive and you have to try it. This dough has a sweet creaminess to it from the touch of cream cheese. I like to cook the filling on top of the stove for a little bit. It just softens the apples, and really brings all the sweetness of the other flavors together. Make sure to make the caramel the night before. To prepare the dough: In a small bowl, whisk the egg yolk and vanilla. Put the flour, sugar, and salt in the work bowl of a processor fitted with the metal blade; pulse to combine. Drop the butter pieces and cream cheese into the bowl and pulse 8 to 10 times, or until the mixture is speckled with pieces of butter that vary in size from bread crumbs to peas. Add the yolk mixture and pulse to combine. Add in the cold water and pulse until the dough resembles soft, moist curds. Pat the dough into a disk, wrap in platic wrap, and keep in refrigerator for an hour at least. In the meantime, make the apple filling. Peel and core your apples and slice to a 1/4 inch thickness. Toss the apples in the lemon juice, cinammon, and sugar. Let sit for about 15 minutes. Next, strain the apples and sautee’ them in the butter on a medium heat. Keep that sugary/lemon juice you just strained. After about 5 minutes, add the apricot jam. Let that juice up a little (you could throw in another pat of butter…go ahead, I know you want to!). Then add the lemon/sugar mixture to the pan. You don’t want the apples to be too mushy because they will cook up in the galette. A can of condensed milk boiled right on top of the stove turns into ooey, gooey, scrumptiously delicious: caramel. Boil the can covered completely in water for about 2 1/2 hours. Boil on a low boil. Make sure your cans are not dented. The cans will be under pressure and you shouldn’t take any chances. I let the can cool until the next morning. I wouldn’t open it before as you do not want a caramel explosion in your kitchen. When we made it this summer, it was caramel paradise! Spoon about 4-6 tablesoons of the caramel into a small saucepan with about a 1/4 cream. Heat the caramel with cream on a medium low for a few minutes. Add the sea salt. The cream will thin it out to a nice consistency so you can drizzle some on around the borders of the galette. Add the caramel to the galette after it’s cooled a little. 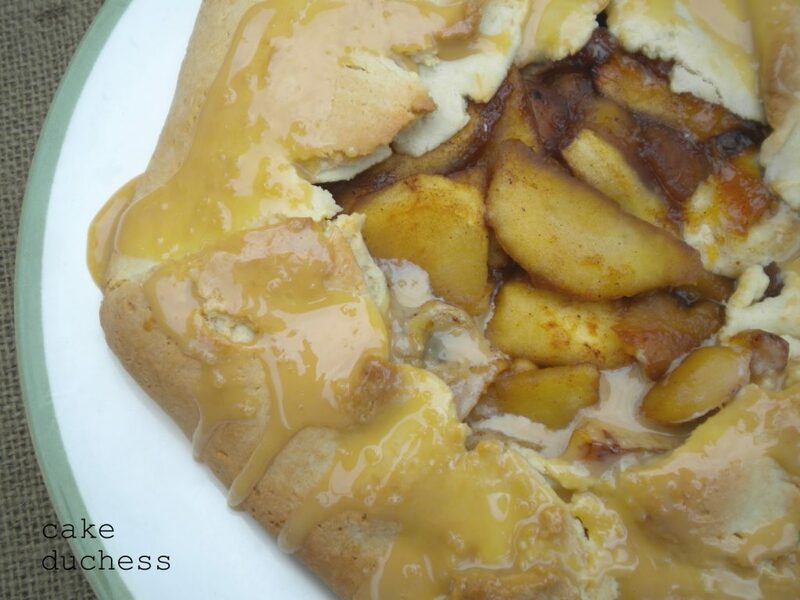 When you have your apple mixture ready, the dough chilled, caramel made…it’s time to make this galette. Make sure while you are making the caramel to preheat the oven to 400 F. Roll out the dough on a lightly floured surface. It can be your kitchen counter (just make sure it’s clean). It should be rolled out to about 15 inches round and about 1/4 inch thick, to be exact. Fold the dough into quarters, and then transfer to your baking sheet lined with parchment paper. Unfold the dough, and then add the apple mixture to the middle of the dough leaving about 3 inches of dough around the apples. Begin to fold over the dough toward the middle of the apples with loose pleats. In a small bowl, whisk the egg with the water. Brush the dough with the egg mixture and carefully spoon on the sugar. If you get it all around the parchment paper, it will start to smell like burned sugar. Bake for about 30 minutes. You want your crust to be a nice, golden color. Not too brown and crunchy. Let it cool down and then drizzle around the border the salted caramel. Now take the galette and HIDE! It is amazing!! This sounds heavenly! Putting it in my list to try! I am so, so ready for fall recipes like this one 🙂 looks delicious! PS, I've got a giveaway going on that I think you might be interested in 🙂 Stop by and check it out! 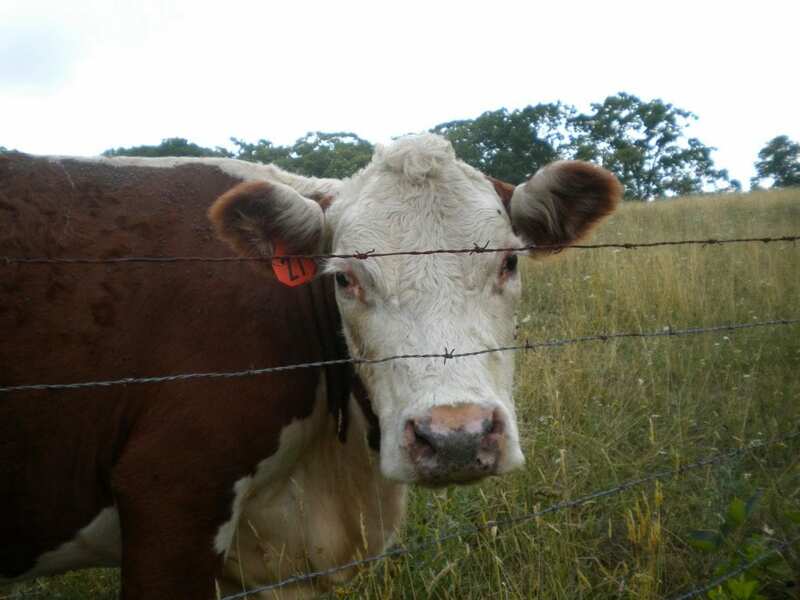 Normally cows scare me but the ones in your photos are super cute! This galette sounds heanvenly. I love salted caramel! I live in the mountains of NC, where did you stay??? YUM! I love the sound of the caramel drizzle! What a perfect treat for fall! Yum! Hope to try this real soon. Just yum! I learned a trick from my Mother re making apple pies (would work for an apple galette, too, as I've done it)–add some applesauce to your apple mixture. This looks like a perfect dessert. Too funny! Cows are so funny.. I have to swerve to not hit them on my way home from work sometimes! (I live in Texas..crazy longhorns) This apple galette on the other hand.. yum-o. Oh cows. I have a warm place in my heart for them, and seeing your photographs brought a smile to my face. Even more delightful is your apple galette! I love rustic tarts, and apple will always be my filling of choice. Thanks for sharing! mmm. the galette sounds lovely! Another recipe that's book marked to make. Caramel gets me every time. 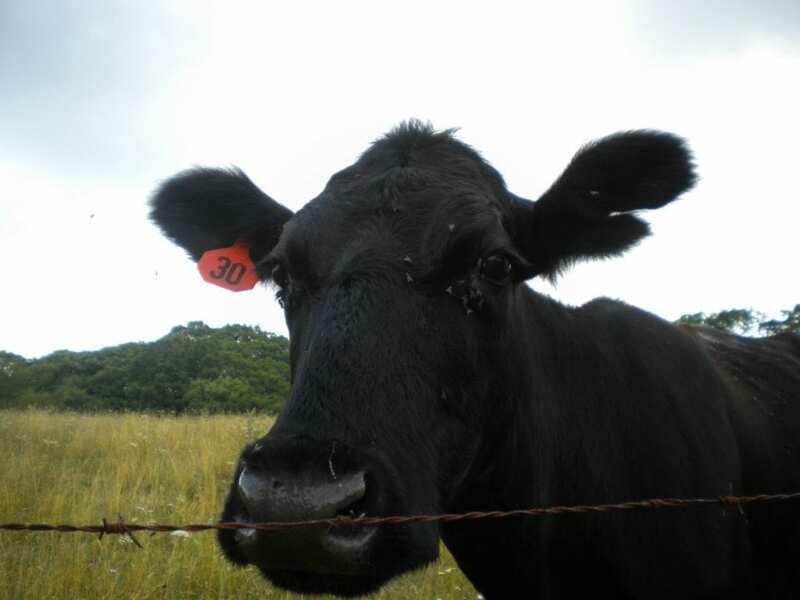 My uncle-in-law has a dairy farm, and while cows may be cute (at times), I've seen them poop on each others' heads so I know how dumb they are too. Even now, I'm shaking my head at their stupidity. But, for caramel, I'll forgive them! I didn´t know your blog!! seems yummyyyyyyy!! I love apple´s recipes. Many hugs!! !